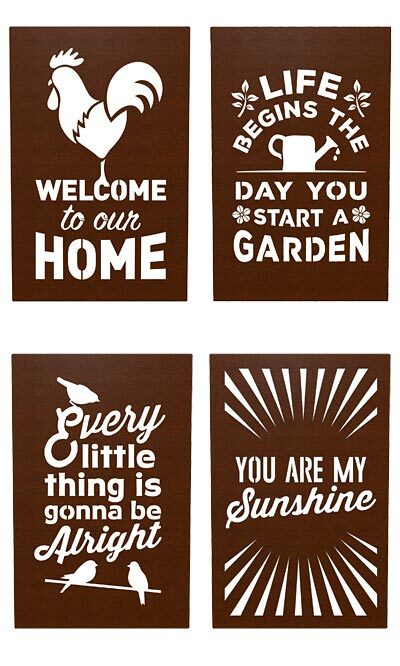 Bring a cheerful look to your indoor or outdoor wall with this Panacea Brown Laser Engraved Wall Art Assortment. These steel plates each sport an uplifting phrase, the precise engraving showcasing your wall behind it. One panel showcases emanating rays and reads "You are my sunshine," while a second has a watering can figure, leaves, and flowers, and says "Life begins the day you start a garden." The other two units have songbird and rooster shapes, along with similar uplifting themes. Their textured steel construction is perfect for use indoors or outside, while the 17" long and 11" wide size of each creates a striking look. A keyhole opening on the top of the sculptures makes it simple to place them against a wall using only a screw, and the brown color meshes with your garden. Place all four of these together for a wonderful home centerpiece, or spread them throughout your backyard for a different look. Add beautiful design to your wall using this Brown Laser Engraved Wall Art Assortment. Note: This assortment includes 4 pieces of wall art. One of each pattern (rooster, garden, songbirds, and sunshine) is included.